0: Auto: This is the default; the focus points flash red only in dim lighting. 1: Enable: Here’s the option to select if you always want to see the focus points flash red. 2: Disable: Okay, you’ve probably figured this one out already. But do note that even if you choose Off, you still see the red AF points light up when you’re using an AF Area mode that enables you to select a specific point or zone. Otherwise you wouldn’t know what AF point you were selecting. 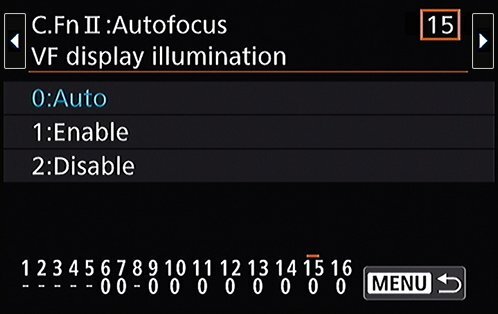 This option determines whether the focus points flash red in the viewfinder when you autofocus.